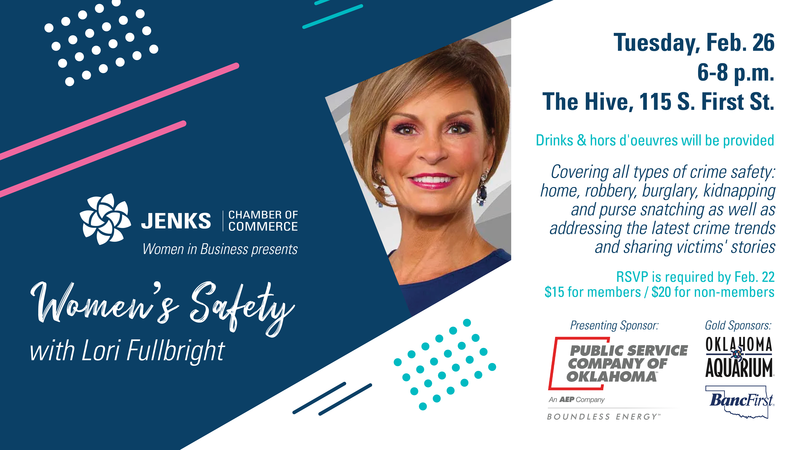 The Jenks Chamber’s Women in Business Initiative invites you to join us for a women’s personal safety class presented by News on 6 anchor and crime reporter, Lori Fullbright / News On 6. Get safety tips to help protect yourself and your loved ones. Topics to be covered include all types of crime safety: home, robbery, burglary, kidnapping and purse snatching as well as addressing the latest crime trends and sharing victims’ stories. Drinks and hors d’oeuvres will be provided. The event is open to the public and cost is $15 for members and $20 for non-members. Registration is now closed for this event. Special thanks to our Presenting Sponsor, Public Service Company of Oklahoma as well as Gold Sponsors Oklahoma Aquarium and BancFirst Jenks for their investment in the Chamber’s Women in Business initiative.